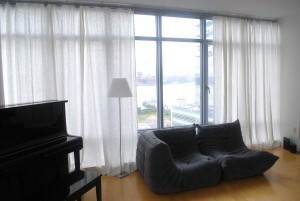 window treatments | Odd Job Handyman Services, Inc.
Curtains and window treatments do more than just offer privacy. They are as important to a room’s overall design as any other element such as paint selection, artwork, and accessories. They are often the finishing touch a room needs to look complete. The right window treatment’s transform a room. It can make a space seem larger, taller, and more grand. Curtains and drapes can also be used to turn a small nondescript window into an impressive focal point. One of the secrets to a successful window treatment is knowing where to install them. Vertical blinds, horizontal blinds, curtains, Roman shades, drapes, black outs, regardless of what window treatments you choose it we can hang it. We have all the tools to rip through concrete and tall ladders to get to those high places and ceilings. We’ll check your blinds out of the box for damage, discuss where you want them, then measure for the brackets, drill, mount them, then install your window dressing of choice. We can hang any product on the market, guaranteed not to pull out or we’ll re-hang the window treatments for free. Book our team today!